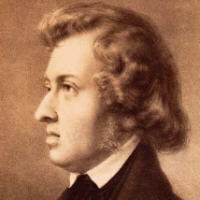 Frédéric Chopin was a composer and virtuoso pianist of the Romantic period. He is widely regarded as the greatest Polish composer, and ranks as one of music's greatest tone poets. George Sand was the pen name of Amandine Aurore Lucille Dupin, the Baroness Dudevant she was a groundbreaking novelist and feminist. 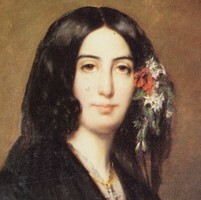 Chopin met the divorced novelist George Sand in 1836 at a salon given by Franz Liszt's mistress the Countess Marie d'Agoult, at the Hotel de France. Chopin also attended but he did not take to the 'dark, dignified and cold' Sand. However, on December 13 he invited her to attend a soiree he was giving. He and Liszt played and George Sand smoked...a cigar. 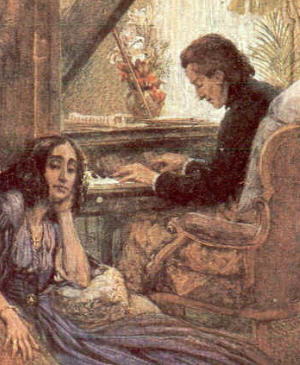 Chopin was both fascinated and repelled by her outspoken beliefs and the two later became enamoured of each other. Gossip about the relationship, however, made living in Paris more difficult and they decided on a trip to Majorca and its warmer climate. The islanders did not accept the sojourners and this was probably the beginning of the end of the relationship. 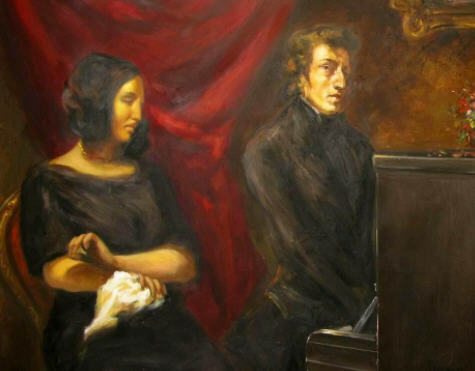 Chopin's possessiveness and jealously did not help and although they remained together for several years the end came after Sand published (in 1846) "Lucrezia Floriani," a thinly-disguised account of their affair. Sand's biographers often see Chopin as a millstone around the neck of an extraordinary and diversely-talented woman. Chopin's biographers are more likely to depict Sand as responsible, in some way at least, for the early death of the composer by relinquishing her care for him in his last years. This is also, of course, a tacit admission that we have her to thank for keeping him alive for so long and well enough to compose. As she had discovered early on in their relationship, on a trip to Majorca in 1838, Chopin was peculiarly vulnerable to illness, his constitution undermined by tuberculosis. He might well have been carried off before the 39 years allotted to him had George not taken him into her care at Nohant and in Paris. She gave him the right conditions in which to compose. Like her or loathe her (and she was often reviled in her time), George Sand was a remarkable woman - a prodigious novelist, dramatist and campaigner for all manner of political reform. 'The first modern liberated woman' to quote Noel Gerson, one of her biographers. She successfully divorced her husband and kept control of her children at a time when such a course of action by a woman was almost unheard of. Chopin was one of many famous men in her life, but it is their affair that seems to have had the most impact on her life and legacy. For Chopin, George Sand was the love of his life - lover, mother, nurse, companion and muse. After the relationship fell apart, in 1847, he scarcely put pen to manuscript paper again, before his death two years later. Chopin never stopped loving George Sand. Amongst his belongings, found after his death, was a small envelope inserted into the back of his diary. It was embroidered with the initials 'G.F' ('George/Frederick') and contained a lock of her hair.